Going to your first football match is a memory that every fan cherishes forever. Each time you go back to a certain stadium, it can bring images from a bygone era – be it short shorts, wacky strips or heaving terraces – all flooding back. 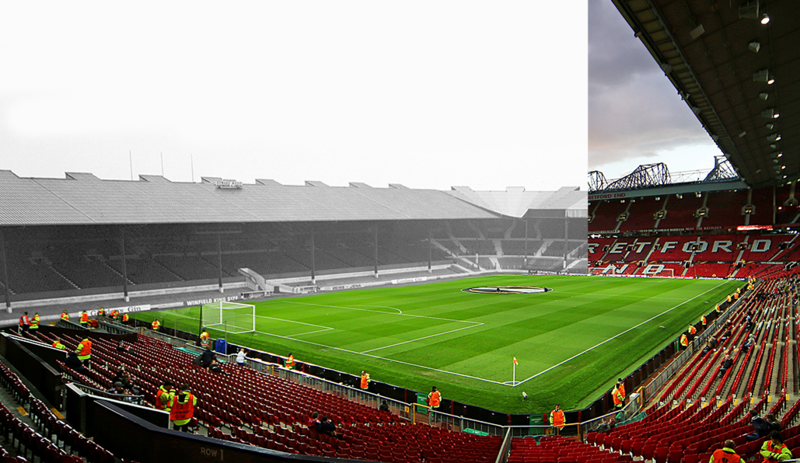 Betway Insider have decided to take a trip down memory lane and create a series of images showing how Britain’s oldest and most iconic football stadiums have changed over the years. 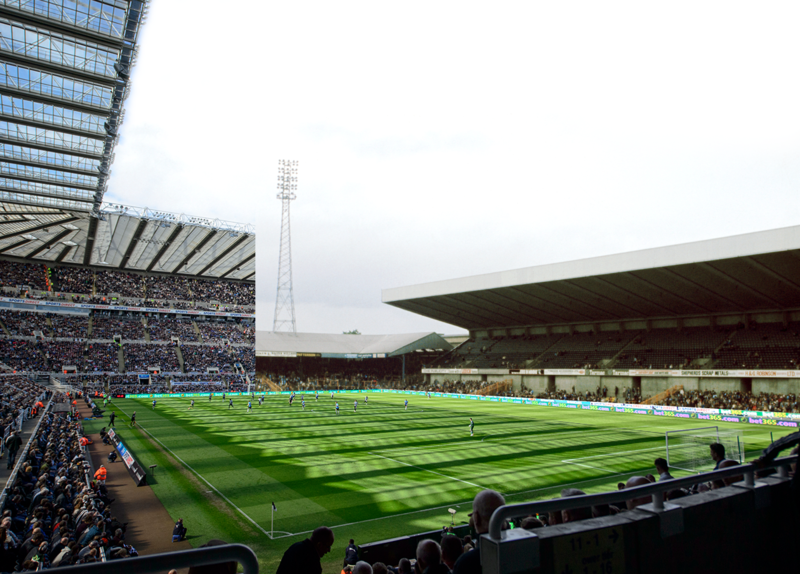 Often described as the “Cathedral on the Hill”, St. James’ Park showcases one of the biggest stadium changes on our list. Between the historical stands, you can catch a glimpse of the listed buildings that prohibit any expansion of the East Stand beyond its current capacity, something that still remains an issue today. In the historical image, we see Newcastle United fans waiting for the return of the Inter-Cities Fairs Cup (now the Europa League) after their victory in 1969. The stadium changed beyond recognition between 1993 and 2000, increasing its capacity from 30,000 to over 52,000. Old Trafford is the biggest stadium in English club football with a capacity of over 74,000. Famously described as the “Theatre of Dreams” by Bobby Charlton, the stadium has seen its fair share of success, with Manchester United winning a record 13 Premier League titles. As the image shows, the stadium has been expanded considerably since 1966. The dugouts have also changed format, swapping traditional stand-alone benches for heated seating held within the South Stand. One of England’s most recognisable stadiums, Villa Park has hosted 55 FA Cup semi finals in its time, more than any other stadium. The historical image shows Villa Park without seating in 1966, the same year that it was one of the host stadiums for the World Cup. That’s a stark contrast with the 42,682 seated capacity stadium of today. Despite the club currently being in English football’s second tier, the home crowd still averages around 32,000 per match. 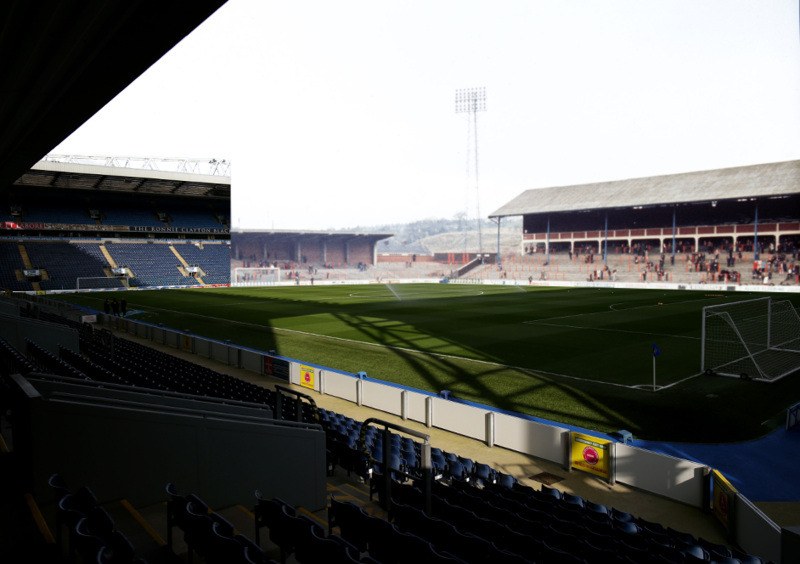 The home of Blackburn Rovers, Ewood Park has changed considerably over the past 41 years. Perhaps the most striking difference between the previous stands and new is the prominent red colour, which contradicts Rovers white and blue kits, although the club badge does still feature the red rose of Lancashire. The image also shows the contrast between the old-style terraces and modern all-seater stadiums. Another feature is the large, standalone flood lights that still exist today, although they have been updated. Opening in 1897, Elland Road has been the home of Leeds United for 121 years. 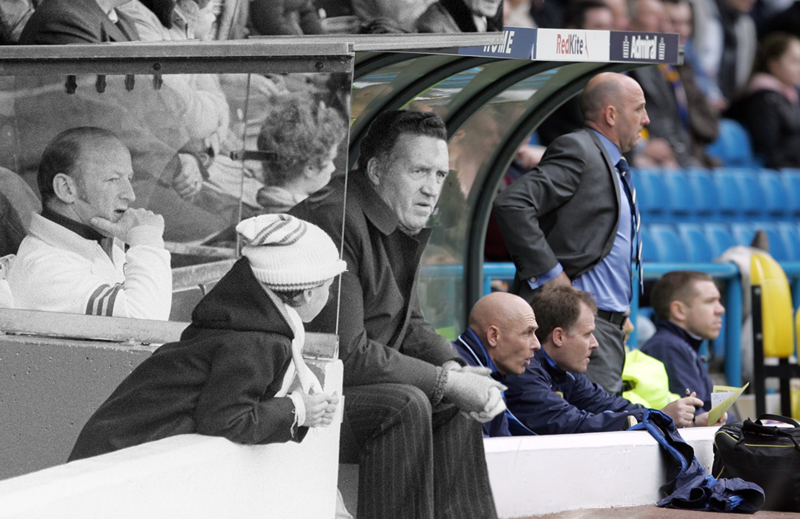 The historical image shows Jock Stein watching a game between Leeds United and West Brom in 1978. One of the key differences in the Elland Road dugout over the years is how close supporters are able to get to the manager, with a young boy seemingly talking to Stein during the game. The modern-day image shows Gary McAllister in 2008 surrounded by backroom staff. Opening in 1910, Bournemouth’s Dean Court has been a fixture of the Football League for over 100 years. The historical image shows Bournemouth playing Manchester United in the sixth round of the FA Cup in 1957, a match which saw their largest ever attendance of 28,799. You can see from the historical image just how tightly packed the fans are in the older version of the stadium. 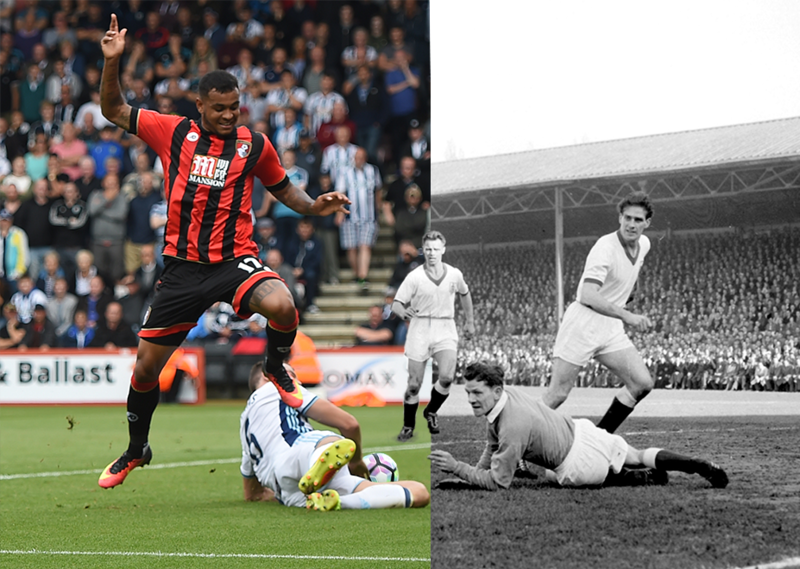 Currently, Bournemouth have Callum Wilson and Joshua King leading the line, who can be seen attempting to score against West Brom goalkeeper Ben Foster in 2016. Goodison Park is a staple of the Premier League, with Everton playing more seasons in the top flight than any other team. 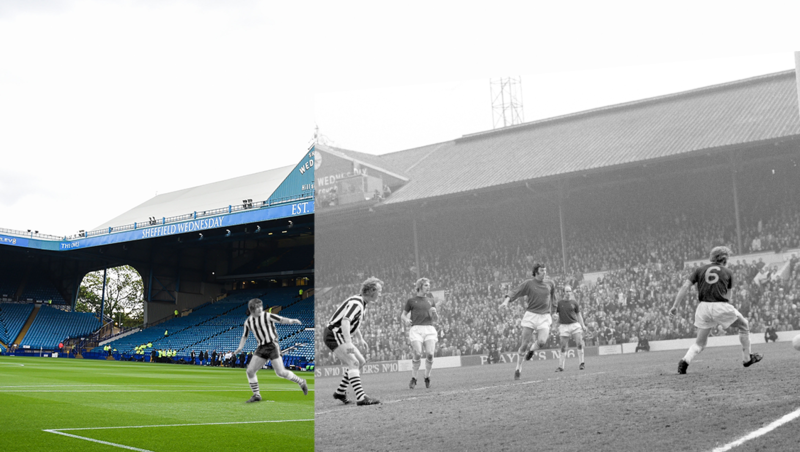 This stability that has allowed Everton to greatly improve and expand their stadium since 1966, which you can see from the contrast between the old and new stadiums photographed. Although commonplace in today’s stadiums, the Toffees were the first team in the country to install a scoreboard. Intriguingly, when Everton beat Southampton 8-0 in September 1971, the scoreboard didn’t have enough room to display all of the goal scorers names, and simply read “7, 9, 7, 9, 8, 9, 9, 7”. Situated on the banks of the River Thames, Craven Cottage is perhaps the stadium that has changed the least in our series. In the historical image, Fulham is hosting a trial match in 1947. You can see the famous cottage situated between the Johnny Haynes Stand and Putney End. Although the original Cottage burned down in 1888, the one we see today has been standing since 1906. The stadium still maintains some of its traditional features such as the historic triangular gable on top of the Johnny Haynes Stand, one of the few remaining in British football. 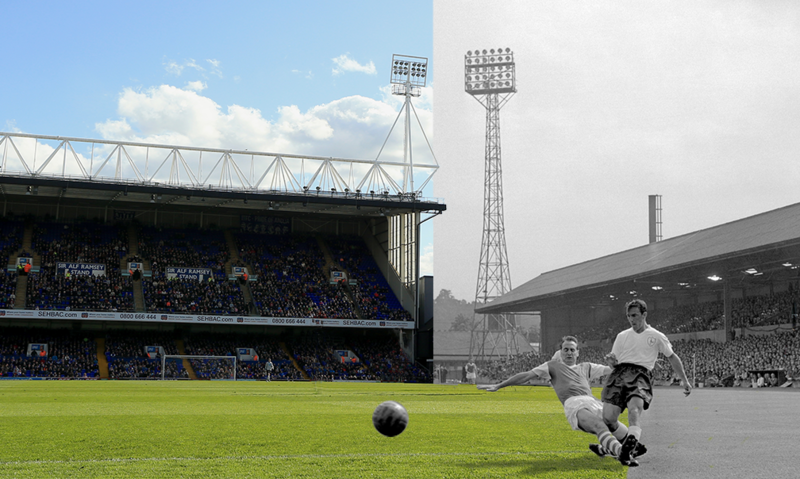 Portman Road has been the home of Ipswich Town for over 130 years. Promotion to the Premier League created the funds for stadium improvement in the early 2000s, raising the capacity to just over 30,000. The foreground image was taken during 1960s, the first decade in which a totally synthetic football was produced, meaning it absorbed far less water than its leather predecessor. Another notable feature of the image is the floodlights that tower over Portman Road. As the decades have passed, the standalone floodlights have been succeeded, with their counterparts being placed on top of the stands for better coverage and illumination. St Andrew’s, the home of Birmingham City, was opened in 1906 and has a current capacity of 29,409. 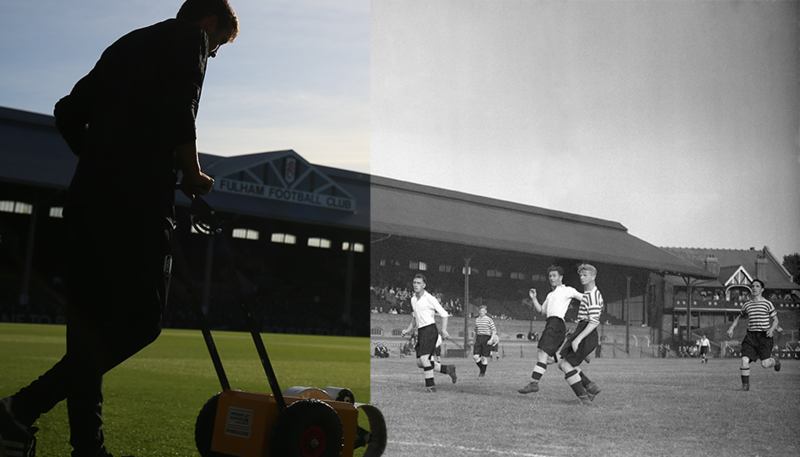 It’s evident how much the quality of the pitch has changed since 1953, with it resembling a quagmire rather a professional football pitch. 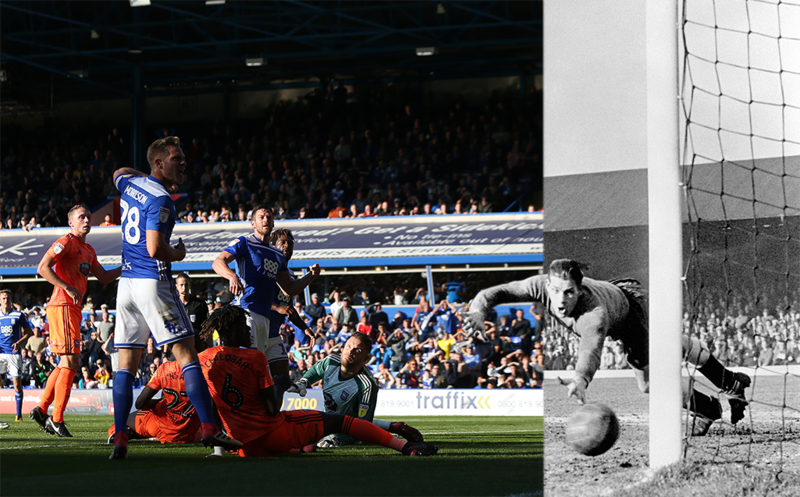 The modern-day image shows current Blues striker Lukas Jutkiewicz scoring his second goal against Ipswich in September 2018. 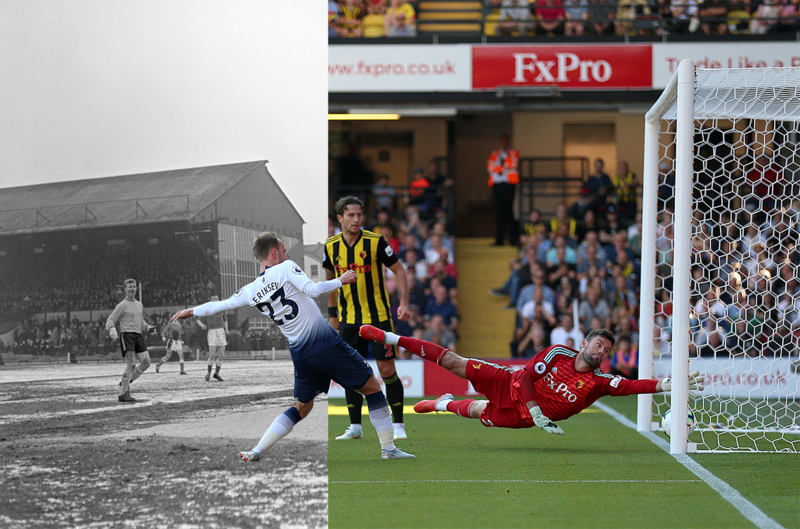 On the right, we can see Spurs goalkeeper Ted Ditchburn being beaten by Billy Wardle’s 25-yard strike, with the match ending 1-1. Burnley have been participating in the Premier League for three consecutive seasons, with the modern photo showing Bournemouth players scrambling to block a Charlie Taylor effort on goal in 2018. 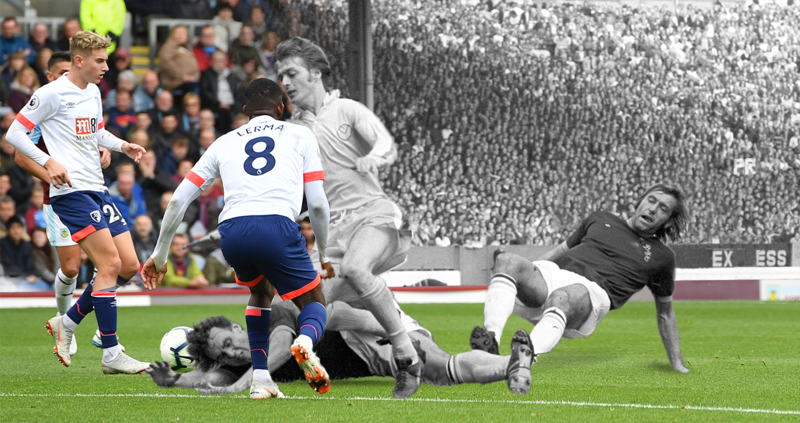 In contrast, the historic image from 1974 shows Burnley defender Keith Newton being watched by thousands of fans as he attempts to tackle Leeds forward Allan Clarke. Turf Moor has remained a closely-knit, typically English stadium while building on its older stands, something that is often lost due to expansion. Home to Celtic since 1887, Celtic Park was renovated between 1994 and 1998 at the cost of £40m to increase the capacity to 60,411. In the historical image, Rangers goalkeeper Billy Ritchie, who isn’t wearing goalkeeping gloves, is beaten by a shot from Hoops striker Bobby Murdoch in what was Celtic’s fourth goal in a 5-1 win during the 1965/66 season. Although the image is grainy, Celtic players are instantly recognisable in their famous horizontal green and white hoops which are still worn today. 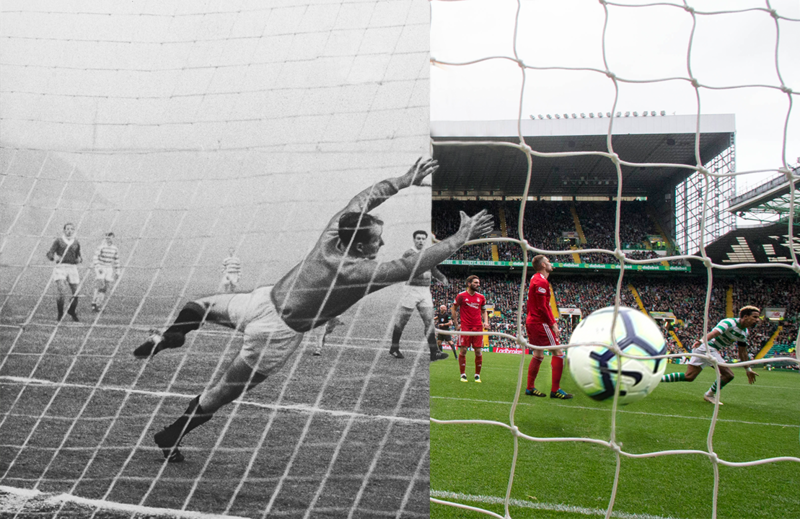 In the modern image, Scott Sinclair can be seen scoring against Aberdeen in the Scottish Premier League. Home to Chelsea, Stamford Bridge has stood for 142 years. During this time, the stadium has seen some extensive redevelopment. Originally, the pitch was surrounded by an athletics track and was also used for greyhound racing. 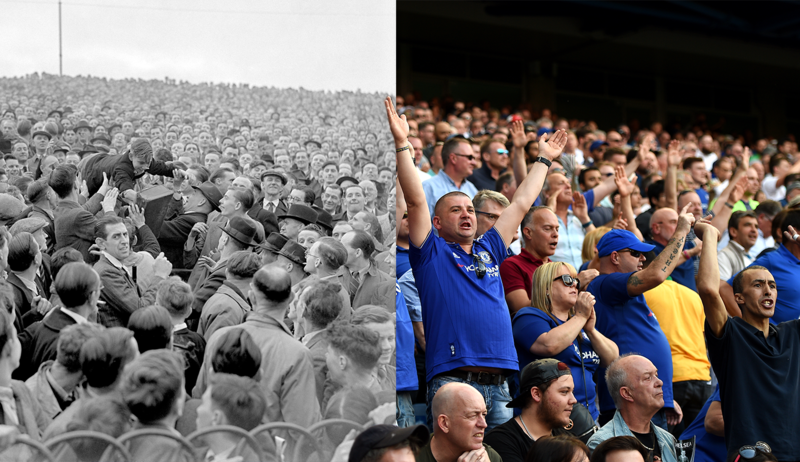 The image shows a young fan being passed over the heads of the crowd to a better viewing position in 1947, something that you wouldn’t see in modern stadiums. It’s also notable that several fans are enjoying a cigarette, with one even smoking a pipe. In the modern Stamford Bridge, fans are seated and not permitted to smoke. Selhurst Park has been the home of Crystal Palace since 1924, with a current capacity of over 26,000. 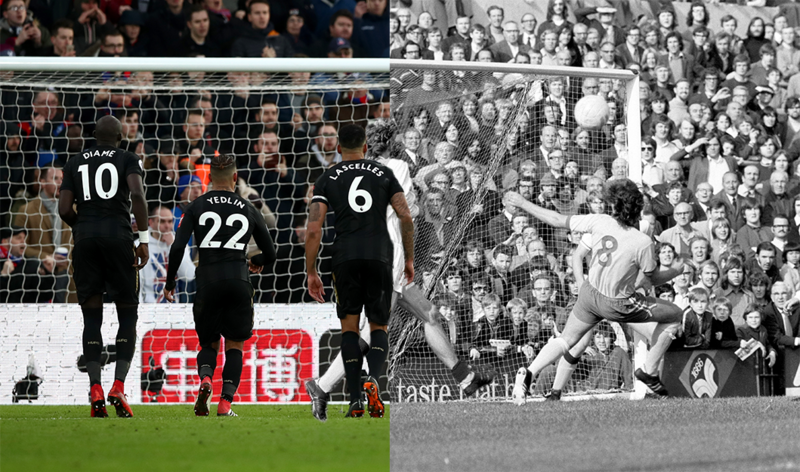 Our image shows Newcastle United players looking on as Eagles captain Luka Milivojevic scores from the penalty spot to level the score during their match in February 2018. As the Premier League has grown, it has become an increasingly global game. This is evident on the advertising hoardings, changing from British brand Truman’s in 1972 to an international company in 2018. One of the most historic stadiums in England, Anfield is famous for its Champions League nights under the lights. 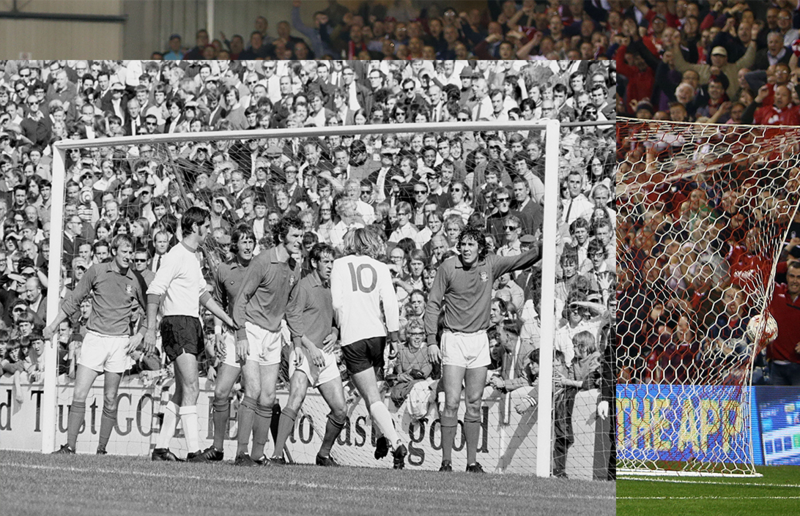 The image depicts Liverpool’s Kop End in 1969 and 2018. 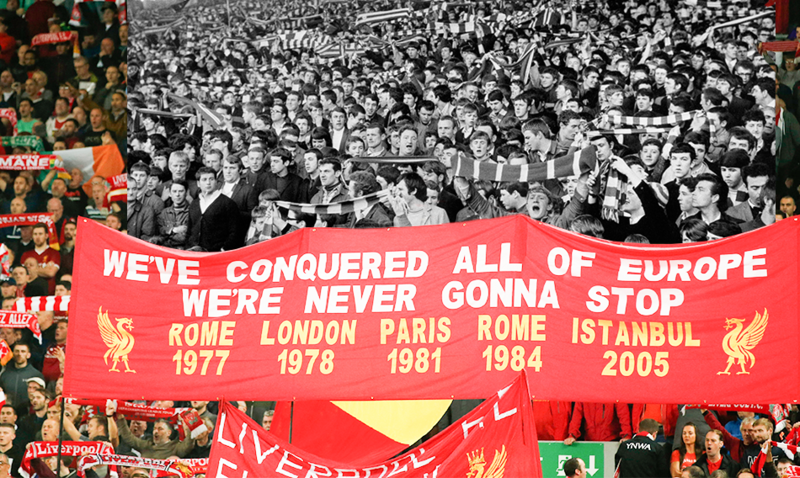 The modern-day banner shows the dates of all of Liverpool’s Champions League wins, which all took place after the older image was taken. One ever-present feature throughout both images is the use of scarves, with the stand resembling a wall of red before kick-off. 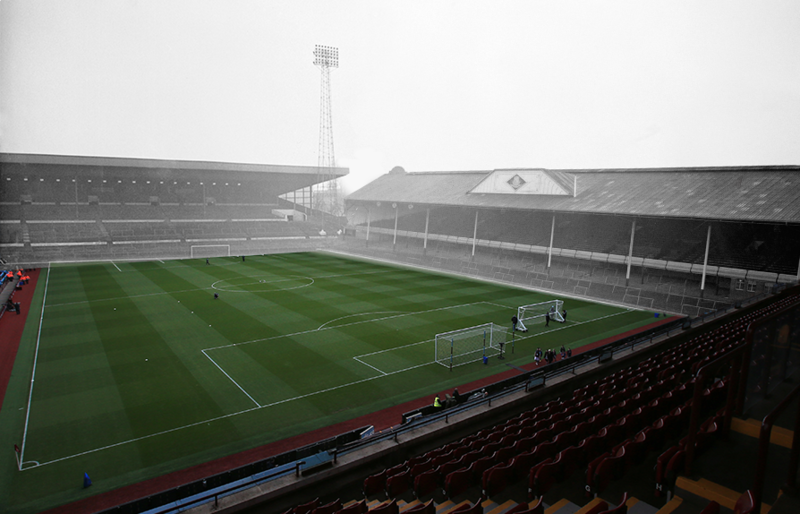 Nottingham Forest’s City Ground has been the scene of many special moments. During their heyday under the stewardship of Brian Clough, the Forest faithful saw their team win back-to-back European Cups (now the Champions League). The image showcases how advances in technology have changed football stadiums, with modern electric advertising boards having replaced their static counterparts. In the historic image, the Forest defence prepares for a Sheffield United corner kick in 1971. Ibrox can be found on the south side of the River Clyde and is home to Rangers, one of the biggest teams in Scottish football. 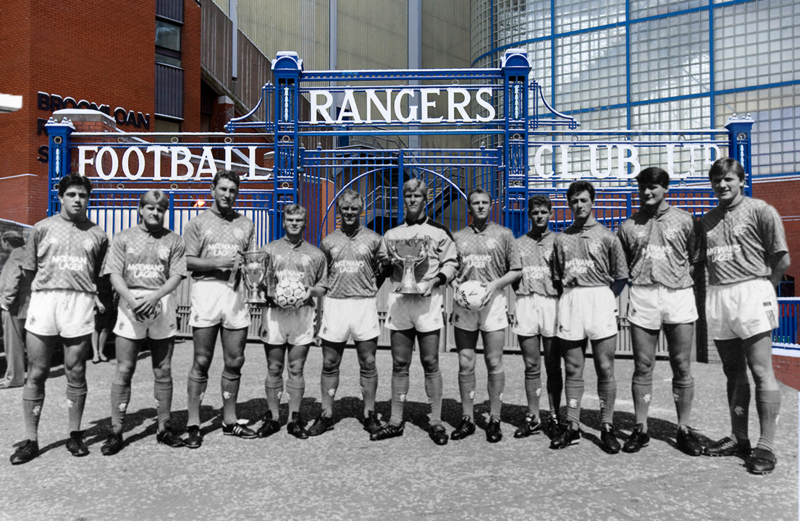 In the image, the Rangers squad featuring Derek Ferguson, John McGregor and Jimmy Philips pose outside the famous Ibrox gates to show off the Scottish Premier League and League Cup trophies that they won in the 1986/87 season. The gates have stood between the Main and Copland Stands since they were rebuilt in 1978. Before Wembley was used to host all FA Cup semi-finals in 2008, Hillsborough was a regular venue. In total, the stadium has hosted the FA Cup 33 times in its history. The image shows Malcolm Macdonald scoring for Newcastle United against Burnley during the 1974 FA Cup semi-final, a game Newcastle would go on to win 2-0. Despite some modernisation, such as the removal of the supporting beams in the South Stand, Hillsborough has maintained its feeling of a quintessential English football stadium. Vicarage Road is the home of Watford FC, who are currently enjoying their fourth successive season in the Premier League. Following the completion of the extended Sir Elton John stand in 2014, the current capacity now sits at 23,700. An obvious difference between both images is the quality of the pitches. In the historical image, mud and snow are laying on the pitch making it difficult to tell the location of the 18-yard box, something that wouldn’t be allowed in the modern game. Molineux was one of the first stadiums to install floodlights and hosted some of England’s earliest European club games throughout the 1950s. The stadium has been renovated several times over the years and has a current capacity of over 32,000. 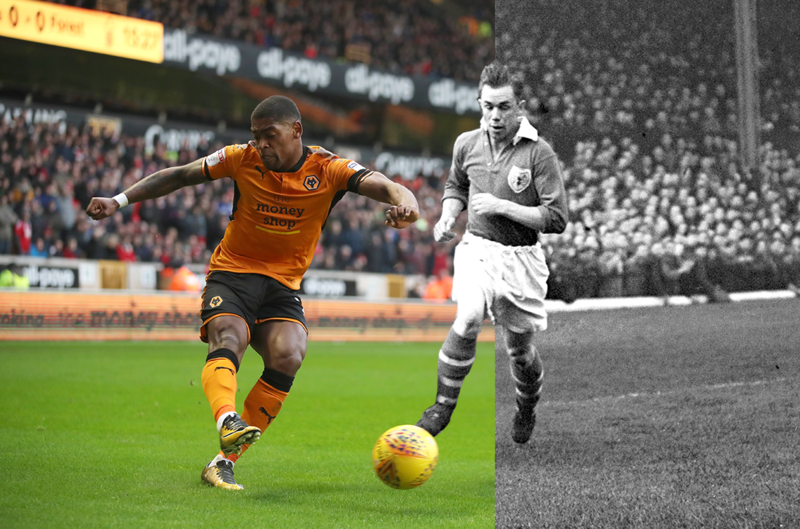 The image shows current Wolves winger Ivan Cavaleiro attempting to cross the ball while battling with Bert Johnson, who played for Charlton Athletic between 1946 and 1953. A striking difference is the kits both players are wearing, with the modern-day shirt being lighter and more flexible than it’s cumbersome 1950s counterpart.